Definition: A digraph $G = (V(G), E(G))$ is said to be Connected if its underlying graph is also connected. If the underlying graph of $G$ is not connected, then $G$ is said to be a disconnected digraph. This digraph is disconnected because its underlying graph (right) is also disconnected as there exists a vertex with degree $0$. 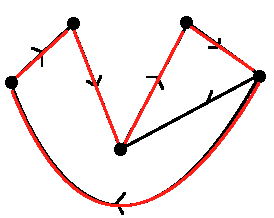 This digraph is connected because its underlying graph (right) is also connected as there exists no vertices with degree $0$. Definition: A digraph $G = (V(G), E(G))$ is said to be Strongly Connected if and only if there exists a path between each pair of vertices (which implies that the underlying graph of $G$ is connected). Thus, this graph can be considered strongly connected. Verify for yourself that the connected graph from the earlier example is NOT strongly connected.